Bank Teller: "You're a writer?" Mild surprise reflected on his face, rivalled only by the mild surprise reflected on the face of my inner critic. Me: "Yes, I am." The answer flows freely. Bank Teller: "So, have you published any books yet?" Amiable and quite interested. I think. Me: "No, but I am published online, an article appears in an overseas based e-zine." The words tumble forth like they've taken on a life of their own. "But I am busy writing a book…"
On NaNoWriMo Eve, I posted this on Facebook. "Nano fever is in full swing!! I really admire the NaNoNites. I've never done a NaNoWriMo. Not sure if I ever will. Maybe one day. The thing is, I'm not sure that I'm wired in that way… by this I mean, producing 50K in ONE month. So it got me thinking that maybe I could approach it differently. For example, plan two 25 000 word pieces? Or five 10 000 word pieces? Or ten 5 000 word pieces? The last one seems the most palatable for me. That means, for the entire 30 days, I'd write a new piece every 3 days? Eeeeeeeeeek! Has anyone ever approached the challenge in this manner? Okay, these are just my thoughts… for future reference… or not…"
Commenter: "I think quite a few people are doing NaNo rebel things…the offical way is a 50K novel, but NaNo Rebels even have their own pages on the NaNo site! 50K in many different ways! Me: "Ha! I've NEVER done a NaNo. Imagine a novice being a rebel? A bit cheeky, wouldn't you say?" Commenter: "The epitome of being a rebel…start the way you want… Ha ha!" Me: "Ha! A good way of beating NaNo before you even start! Take that NaNowriMo!" Me: "Are you ladies trying to drive me back to my coffee addiction that I left behind about two months ago? LOL. For me, writing 2 000 words on a particular day, is an annual occurrence… need I say more? Okay, to be honest, I discovered this about two weeks ago when I wrote 2 000 words one of the days…"
In conclusion – I've never done NaNoWriMo before. No, I'm not doing it this year. Yes, I may still do it at some stage in the future… can't rule out that possibility. Yes, I wrote 2 000 words on a particular day, (this was not planned) just under three weeks ago. I'm excited to be co-hosting the IWSG today, together with the following awesome people CD Coffelt, Tina Downey, and Isis Rushdan. Remember to pop in and say hello to them. Don't forget that the Twitter hashtag is #IWSG! Love it! I've written several books (first draft) during WriMos, but the first one I did was my 4th book–I think there is some practice to it. Now I ALWAYS write fast. I go on tangents if I don't. But I am being a rebel this month, too–I am writing a serial and have 4 episodes I am trying to write–and PART of it was written much earlier (I am converting a novel to this serial). You are a writer and an author – stand tall in that declaration. And thanks for co-hosting this month. I get the same reaction from strangers if I admit I'm a writer, which I rarely do. My own family is just now coming to terms with it, after the release of my first novel. No one has the foggiest notion of the time consuming effort it takes to write, only a writer fully understands. Good for you for claiming your writer status. I don't NaNo either. Even if I were single and childless and jobless and had every last plot note squared away, I don't think I could consistnatnly write 2k per day. I can relate. I remember when I first started telling people. Actually, my husband started telling everyone before I was ready, but it was for the best. You just have to own it and not care what others think, as hard as it might be. Being published online is still being published. You're a writer, no need to hold out on all your future and potential fans. Shout it from the rooftops, I say! I like that your Inner Critic took some time off. I'd like to lock mine in the closet. Congratulations on "coming out" as a writer. That takes guts because the inevitable question is "are you published?" Thanks for being a host for ISWG today. Michelle, thanks for hosting! You crack me up. Cookies and wombats. Ha! I also think it's good that you're claiming your writerlyness (is that a word?). I also think it's great that you're going to do NaNo you're way. I'm doing the same. In fact, I'm not even shooting for 50k. I'm just trying to get into a groove of writing a new project, never mind the finish date! Yay, inner Critic! Hope you took Inner Critic out for a special lunch or gift buying afterwards! Lexa, I'm not afraid of a challenge, but I think that foraging through 50 000 words to find the gems is hard work. For me, that's what it would come down to. Bob, so right. Nobody feels the slightest self-consciousness to declare another occupation, like I'm a teacher/lawyer/publisher. Amazing, isn't it? Isis, my hubby's first explanation went something like this: My wife writes stories, and then she and her writer friends share each others stories. LOL. M.J., love that attitude M.J. Positivity rocks! Diane, I didn't even think about it. The response wasn't conscious, it just slipped out! I've never done NaNo either, in spite of having started books during November in the past. It just seems so cliché and expected in the writing world nowadays, and I pride myself in being a noncomformist, deliberately not like everyone else. Yay! I hope the Inner Critic's fishing trip is a nice loooong one. 🙂 What a great feeling! Good luck and have fun with hosting today. Say it loud, say it proud! I'm a writer!!! I tried NaNoWriMo last year but November is my busiest month of the year. Epic fail. Best of luck w/ your writing. Great post!! I AM doing NaNoWriMo this month, as a newbie and so far I'm doing much better than I expected!! I am only five days in, but already have passed the 18,000 word mark. Yeah, that way if something comes up, I'm already ahead. I too, thought it would be too much of a challenge with life right now, but after going to a super writer's conference (Florida Writer' Association Annual Conference #FWA13) I was ginned. Thanks for co-hosting this month! And thanks for the hash tag tip! I don't know why we are so hesitant to say "I'm a writer." I never hesitated to say I'm a teacher or I'm a floral designer, etc all the jobs I've done in my life. Hey, it's a job, It's not like you're carrying on about how grand a writer you are. Very very proud of you!! Thanks for hosting. It's amazing how many people think you can't possibly be a writer if you're not J. K. Rowling or Stephen King. Congrats on the silence of your inner critic- that is uterly fantastic! And I, obviously, am a big believe in NaNo. I don't think i could do it either, but now look at me! I hope some year you decide to join the madness with us and give it a try! That's great that you freely admitted to being a writer. I can't do that yet. And I love doing NaNoWriMo. It's crazy good fun. I hope you try it out someday. Funny inner dialogue. It is great when you can finally declare that you are a writer! Just the other day someone asked me if I blog. I thought, where have you been? Oh, well, I gave her my card and said that I'd be happy to teach her some of the finer points of blogging. I tend to avoid these conversation only because the one time I said, Yes, I'm a writer, with bold confidence and a little attitude, the guy said, oh yeah, me too. And, then he went into a 10 minute monologue about his 5th book published book on ancient roman empires. When he stopped and asked me what I wrote, I babbled something and quickly excused myself. haha. Carrie-Anne, you go girl!! Be your own person… that is awesome! J.Q., thanks for the thoughtful words, you are so right. Beverly, you go girl! I admire you NaNoNites! LOL, I loved reading your conversation about Nano. I think I rebel it one way or another every year, but hey, it works for me. Good for you for knowing what works for you. And keep telling people you're a writer, it's good for you. I'm doing Nano for the first time ever. And I'm finding it really tough. At first I thought it wouldn't be so bad, because I normally write 3,000 words a day, so what's 1,666? What I didn't take into consideration was that if I needed to take a day off because of work craziness or crisis or because I just didn't feel like writing, I could. It wasn't a big deal. But now it is. I haven't given up yet–the people I've met through NaNo are fabulous–but it's just one more thing I'm finding stressful this month. Thanks for co-hosting! You ROCK. Good for you! The question still stops me in my tracks. Thank you so much for co hosting this month! I just created a LinkedIn account and put "Writer" as occupation. I wish I could say that I did it proudly, but since I am still unpublished it felt fraudulent. I am looking forward to the day that changes! Good for you on your bank experience!!! I enjoyed your little convo with your inner critic and am glad you proclaimed yourself a writer. My writing style does work for NaNo either, but I always do my part to encourge and support others taking the challenge…Hey, rebels change the world! Had to come 'see' you before going off to bed. Thanks for hosting this month and thanks also for having my back. Much appreciated. You rock! It's pretty cool when we can readily admit that we're writers without hitching when asked. You go on with your bad self, girl. Love this post! I can't wait for the day when I can proudly declare myself to be a writer and my inner critic doesn't fall off it's chair from laughing so hard…. Thank you for co-hosting IWSG this month :)! Charity, I suppose each writer has to find out what works best for him/her. We are all different. Holli, I'm super-nervous at the thought of writing 1,667 words per day. They say – just write – don't worry about what you write… but I'm not sure that will work for me! Doreen, I'm sure you will eventually get to a stage where it doesn't. Robin, I used to feel like a fraud too. After my flash fiction piece was accepted by an e-zine, then I began to feel a little better. Toinette, yep, rebels do change the world! Krystal, I agree with you on the "ENERGY" part of things… It's a great buzz! Lily, thank you for stopping by. Joy, no worries. I have your back… always. Rachel, you will have your day. Don't worry. You will have the last laugh. Cute post. That inner critic will get you every time. Sending it off to entertain itself is good. I applaud your bravery on taking this next step! I would also like to wear my writer badge proudly, but I haven't quite gotten there yet. I'd love to hear more about the book you've been working on. Thanks for hosting the IWSG Michelle! Hehe, you rebel you! I like the ideas of writing multiple peices that add up to 50,000 words. That would be fun. What about 30 short stories that end up being 50,000 total? Talk about pressure! That's a short story every day of the challenge. They might not be good, but they'd be out there and ready to be edited. Hmm, I'm getting some ideas for next year. I'm sitting this year out, regrouping some projects that have been simmering for a while. But next year is a new beast of its own. Who knows where we'll be with our writing by then? And as a dude who is challenging his inner critic, I so relate to your posting. I also know that my inner critic tells lies. And thanks for co-hosting that actual tribute to me, IWSG aka "I Was Seeking Gary." I'm flattered beyond belief! Thanks for being a co-host and for calling yourself a writer. Congrats! Tried NaNo last year and failed to hit 50k. Learned I wasn't a fast writer at all. But at least I wrote enough to form the basis of the book I'm working on now. 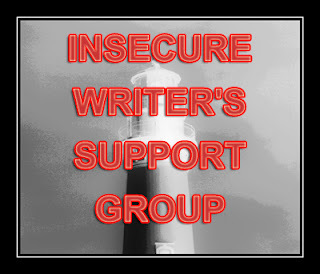 Thanks for co-hosting the IWSG. I think saying it out loud is powerful. I remember changing my fb profile info from former teacher/office manager/HR to WRITER as a statement. Meant something. It was fun co-hosting with you! Jen Chandler, I really "feel" you on the 30 short stories idea… to me, that sounds about right… with thorough planning, it could work. Gary, you've just made my day! I do love your spirit! ChemistKen, sounds like it worked out allright. Emily, being cheered on by a kindred spirit? A lovely thought. I like that Emily. We would have been cheering together. Tina, there is immense power in the verbal declaration! Down with that inner critic! Full speed ahead, Writer. YEAH!!! Say it with pride. You are a writer. =) Woot, woot! NaNo rebels… I must have spawned that site in my sleep. 😉 I think the important thing is just making progress. Who care where the words go, as long as they're happening. Way to go with announcing yourself as a writer!!! Yahoo for declaring yourself a writer. You are so right about the online banking thing. We had a check stolen and cashed that we sent to our daughter at college. The hoops we had to go through to protect ourselves are still going on. I was just at the bank, too, and the customer service rep asked me about my job as a writer. The response was a lot more positive though. He said writers produce material that keeps on giving. I had never thought of it that way. can always count on mish for a laugh! awesome! cheers to choosing to do nano or not! Could you have a word with my inner critic LOL?! You should be proud of your accomplishments as a writer! I know how you feel. Sometimes I'm a little shy talking aobut being a children's author, too. But those of us who can create stories are fortunate so we should all be happy to talk about our accomplishments. C.Lee, you are tooooooo cute! Crystal, hip, hip hooray! Now let's eat some cheese! Tara, glad I could keep you entertained! Deanie, you are right. We should be proud of our creativity. Congratulations on your writer acknowlegement. I know you don't like telling people that you are a writer so it must have been really hard. I have never had the guts to do NaNoWriMo and I don't think it is something I would participate in, but I always cheer the participants on.